I created a Richfaces 4 web application with Maven and open the sample index.xhtml file with the visual editor. is marked red with "Template file is not found", although the file exists and the path is correct (the folder templates is in the same directory as index.xhtml). If I remove the leading slash, i.e. templates/template.xhtml, the error disappears. But this is not as it should be, so I assume that is a bug in jboss tools. VPE resolves the relative path templates/template.xhtml without any problems since it is relative to the current file. /templates/template.xhtml is on the other hand absolute and thus it needs to know the root of your webapp to resolve it. 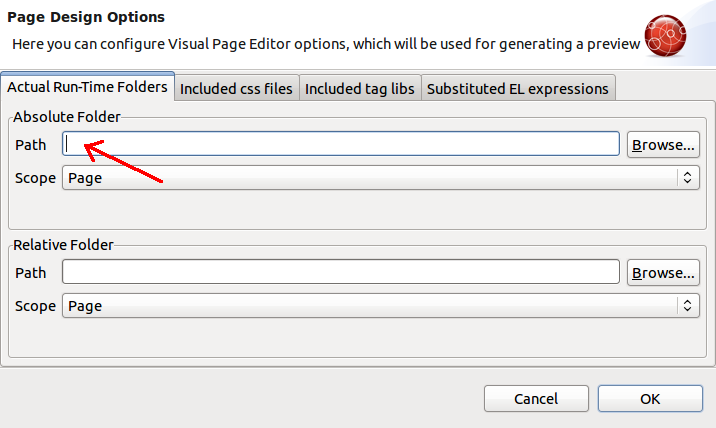 1) Edit VPE page settings for the xhtml to set the root webcontent. 3) install Jboss tools maven integration and Maven > Update Project Configuration and it shuold be enabled on its own. #3 is probably your best option here since you are using Maven. I had JSF Capabilities already enabled and JBoss Maven integration installed, but the problem persists. Could you please explain your point 1 a bit more detailed? Where do I edit the page settings? Could you check what you have in .settings/org.eclipse.wst.common.component file? I'm curious what is in wb-resource element with deploy-path="/" attribute? Alexej, your third option worked. 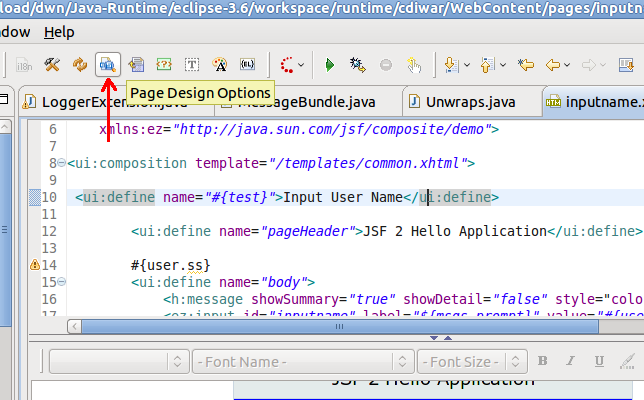 And after restarting Eclipse, now it works even without setting the absolute folder! Before, I had another line in the file (see thread http://community.jboss.org/thread/162518?tstart=0) which was always recreated when I right-clicked on the project and chose Maven>Update Project Configuration. Now I deleted it again and this time it was not recreated (due to the restart of Eclipse?). Maybe this was the reason that the path was not resolved correctly.